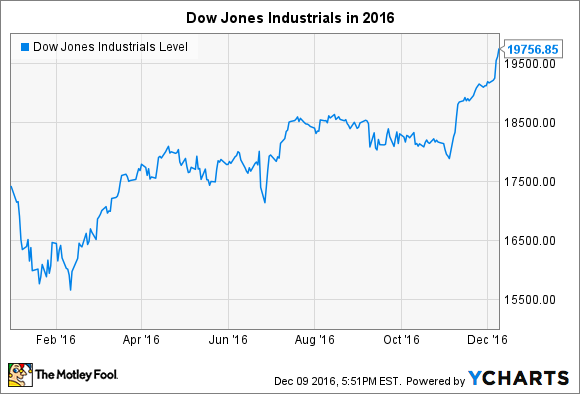 What Happened to the Dow in 2016? The average bounced back sharply from poor performance last year. Coming into 2016, the Dow Jones Industrials (DJINDICES:^DJI) had something to prove, having suffered a losing year in 2015 for the first time since the 2008 financial crisis. Yet the Dow was up to the challenge, and with just a few weeks left to go, the average has gained more than 13% and might well be able to jump above the momentous 20,000 mark for the first time ever before the year is out. Along the way, it was interesting to see some of the crosscurrents within the Dow that affected its component stocks. Let's take a closer look at what happened to the Dow in 2016. The stock market suffered a loss of confidence to begin the year. After seeing the first 10% correction in four years during the summer of 2015, the Dow started the year with a similar decline in January and early February. From its beginning point on Dec. 31 of 17,425, the Dow hit a low in February of 15,660, which represented almost exactly a 10% drop. The correction stemmed from a plunge in the energy markets, with oil prices falling to about $26 per barrel at their worst levels. Although oil companies make up only a small portion of the Dow, investors were concerned about the potential impact on the overall global economy and on the Dow companies that provide vital products and services to major players worldwide. Moreover, the specter of negative interest rates in Europe and Japan made investors nervous about the prospects for corporate growth. Yet the Dow's correction was short-lived, and by March, the average had regained all of its lost ground and proceeded higher. Improving oil prices throughout the rest of the year restored investor confidence and made people focus more on business fundamentals, which were generally solid. Throughout much of 2016, the market treaded water, but volatility increased as the 2016 presidential election neared. Many found President-elect Donald Trump's victory surprising, but an initial plunge in overnight trading on the night of the election quickly gave way to investor enthusiasm about the prospects for the new administration. Since Election Day, the Dow has climbed through the 18,000 and 19,000 levels, and the 20,000 mark would require gains of just over 1% to achieve. Also of interest was the fact that the strongest stocks in the Dow came from several different sectors. The top performer was Caterpillar (NYSE:CAT), which soared more than 40%. The company has suffered mightily during the commodity crunch in recent years because pressure in mining and energy only added to the woes the heavy-equipment manufacturer was already feeling from depressed construction and infrastructure activity. But rebounds in metals and energy helped give Caterpillar a sense that there might be light at the end of the tunnel, and new hopes for greater activity could spur even faster growth. UnitedHealth Group (NYSE:UNH) also fared well, climbing 36% so far this year. Decisions to make tough but smart moves in offerings on the health insurance marketplace under the Affordable Care Act seemed to produce desirable results, and the idea that Obamacare might see considerable changes in the years to come pushed the stock to all-time highs late in the year. Finally, Goldman Sachs (NYSE:GS) gained 34%, leading a charge higher for financials. Again, most of Goldman's gains came toward the end of 2016, with new enthusiasm that financial markets will be stronger going forward. The only major decline within the Dow came from Nike (NYSE:NKE). The athletic footwear and apparel giant continued to take advantage of the broader trend toward greater demand for fitness-related products, but some of Nike's success in fending off competitors seemed not to work as well in 2016 as it had previously. Rival companies have followed in Nike's footsteps by finding lucrative endorsements from major athletes, and Nike's size has made it harder for it to sustain the growth rates that its smaller industry peers have been able to achieve. After such strong returns in 2015 and in previous years, Nike was arguably due for a pullback, but many investors still seem uncertain whether the company will be able to recover fully from its setback during 2016. The Dow has enjoyed great returns in 2016, and a slate of record highs bodes well for the momentum the average carries into the New Year. Even though many investors see other indexes as being more relevant in measuring the strength of the broader market, the Dow Jones Industrials continue to be the highest-profile sign of the bull market's sustainability for another year.